The more Sir David McVicar does as an opera producer the less controversial – remember Aida at Covent Garden in 2010? – he is becoming. Perhaps this depends on how willing the opera house who employs him is at embracing outrageous ideas? Vienna or New York are two of the most ‘conservative’ there are and perhaps that explains his approach to his recent work there. Also in my review of his equally bland Adriana Lecouvreur at Covent Garden (review here) I suggested he is now the natural successor to Jonathan Miller. Not that there is anything especially wrong in that, but it is not how he became famous …or should that be infamous? David McVicar’s Tristan und Isolde was new in 2013 and I watched the live stream of this production in 2015 (when Petra Lang sang her last Brangäne) and so knew what to expect. There is a slightly Japanese influence to Robert Jones’s designs, more so in his sets than in his costumes. Tristan looked mostly like a warrior monk and Isolde had a sequence of exquisite gowns culminating in Act III when she wears a rich-red one with a flowing train. King Marke in an ivory cloak with lots of feathers looked the most oriental (regardless of the fact that Kwangchul Youn was portraying him). This was McVicar’s debut production at the Vienna State Opera and he seems not to have much to say about the opera. He just provides a framework for the singers to stand-and-deliver which is what they mostly do exceptionally well. This justifies travelling to Vienna – always a wonderful place to revisit – to sit through its six hours (including two short intervals). The staging does neither a service nor disservice to Wagner’s opera and the set is mainly dark with a cyclorama which has a thin strip of what looks like waves. Paule Constable’s lighting often has a blue-black hue, but is occasionally red for Isolde, possibly the scarlet woman. A large moon – a familiar Japanese image – is often seen in the background and also turns red at times. For Act I there is the skeletal remains of a boat; a bit like the sixteenth-century Mary Rose raised from the Solent in 1982. In Act II there is a jetty and a highly-stylised stage-deep trunk of a tree which is a potent phallic symbol; though I was not sure what the crown-of-thorns in neon lighting was supposed to represent. Finally, in Act III there is a huge landslide of rocks and a simple chair for Tristan to be slumped in. That is about all there is for the three acts. McVicar seemed to have one good idea and that is when Tristan and Isolde drink the potion, their ‘fatal attraction’ is so strong that there is no opportunity for anything to take effect before they embrace in a grey homage to Gustav Klimt’s The Kiss: they remain – and not for the last time – in a clinch seemingly without end. All McVicar otherwise did was introduce some tumbling, prancing, sailors (choreographed by Andrew George) who would have been better suited to Rodgers and Hammerstein’s South Pacific than to Wagner’s transcendent opera. So all the rest was virtually left to the talents of a wonderful cast and I believe this is known in Germany as Rampenstehtheater. Thankfully there were such strong interpreters of their roles as Stephen Gould and Petra Lang on stage who brought their characters to life and transcended the routine. There was a great chemistry between the pair who, of course, currently sing Tristan and Isolde at Bayreuth (review here). Unlike their respective compatriots, Donald Trump and Angela Merkel, they were willing to hold hands in the great Act II duet and we believe in Tristan’s sexual capture by Isolde. She first swore vengeance on him because he killed her betrothed, Morold, but quickly submits to her inner desire. Stephen Gould never pushes his voice more than necessary even in his Act III delirium and hopefully this will mean he can continue to sing Tristan – the heaviest of the Wagner roles – for many years to come. He sang Tristan tirelessly and lyrically, bringing clarity to each word of the text. He has all the power needed, but can also sing softly. His final cry of ‘Isolde!’ was heartachingly poignant. Moreover, it sounded effortless even during those Act III agonies which were as vivid as can be expected in the circumstances. 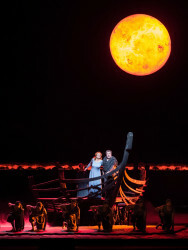 Sophie Koch and Matthias Goerne were ideally cast as the caring Brangäne and stoic Kurwenal; both because of their intelligent acting and their well-judged singing, which was full of meaning. Kwangchul Youn was an overwhelmingly moving Marke, the most human(e) of all the characters. Clemens Unterreiner repeated his sturdy Melot I first heard as long ago as 2006. On the little we heard from Bror Magnus Tødenes as the Young Seaman, he might be a name to look out for as a leading Wagner tenor of the future. Before she melted into Tristan’s arms Petra Lang was every bit the ‘wild Irish maid’ of the libretto and she is a superb Isolde. She looked stunning and was vocally secure throughout the range from her convincing low notes right up to her trademark gleaming, fearless, top. There was a genuine, classy refinement to her performance that only comes from experience. Petra Lang is a consummate artist who sings from her soul and her closing apostrophe, the Verklärung (Transfiguration) – or Liebestod as it more familiarly called – was movingly rapturous. There was never an ugly sound and of how many of today’s dramatic sopranos can you say that? I thought I had heard Wagner well-played in London recently, but hearing it played by the Vienna State Opera Orchestra – in all but name the Vienna Philharmonic – was something on another planet. They brought out clearly the harmonic integrity of the work and its passionate swell. As to be expected there was the great attention to detail in individual instrumental sound: a highlight being the gloomy double basses, winds and horns giving a palpable throb to Tristan’s wound during the Prelude to Act III. After a voluptuous Prelude, Mikko Franck took everything a little too slowly at times and orchestral volume was not under perfect control, which led him to swamp the singers at times. Nevertheless, Act III was appropriately thrilling, though not as profound as it could have been with a more experienced Wagner conductor. For more about the Vienna State Opera visit https://www.wiener-staatsoper.at/en/.